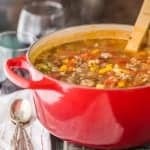 Copycat Carrabba's Sausage and Lentil Soup...your favorite restaurant comfort food made easy at home! This amazing sausage lentil soup is a staple at our house. So delicious! In a large skillet, brown sausage on medium/high heat, crumbling as you cook. When sausage is almost done, add in the garlic and allow to cook. In a large stock pot or dutch oven, combine all ingredients and bring to boil. Simmer for about 1 hour or until lentils are tender. If soup is too thick, add water for desired consistency. Sprinkle with basil, oregano, and parmesan for garnish.